Our flight into Seattle landed at 10pm, so fortunately our friends Dave and Jake who offered to host us for the night live just a few minutes from the airport. Of course we stayed up talking and hanging out with them and their three crazy dogs for a while. Thankfully we were able to sleep in until 9am. 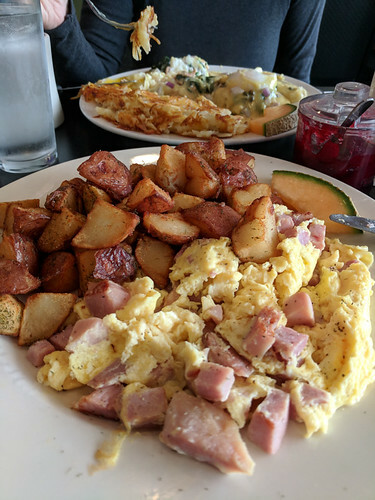 After a quick re-pack of the car we headed to a filling breakfast at Shelly’s, where I had a salmon benedict and Eric had an omelet with huge chunks of ham and crispy potatoes. My benedict had WAY too much hollandaise sauce but was otherwise good and the coffee was solid. Completely stuffed we started the drive south through Tacoma, Olympia, and Portland – took a little over 3 hours – not bad! About halfway the clouds suddenly parted and we had beautiful blue skies and sunshine for the rest of the trip. We had a 3pm appointment for tasting at Erath, and with an hour to kill we wanted to try another nearby winery. Unfortunately our first choice was closed so we decided on Hyland Estates. They are located behind our B&B so we first checked in and dropped off our luggage, hoping to find a tasting card and sure enough! Complimentary tasting for 2 plus 10% off a purchase when buying a single vineyard pinot noir. Our tasting with Paulina at Hyland Estates was very nice. We arrived at the same time as an older couple so we all did the tasting together. She was very knowledgable about the wines and I had no trouble understanding her even with her French accent. We tried a Gewürztraminer, Chardonnay, their standard Pinot Noir and two single vineyard Pinot Noirs, Clone 117 and Coury Clone. Our favorites were the Gewürztraminer and the Clone 117. We overheard the manager tell another group that the Gewürztraminer was buy two get one free so we got the same deal plus a bottle of Pinot. Came out to be $100 with the B&B discount. 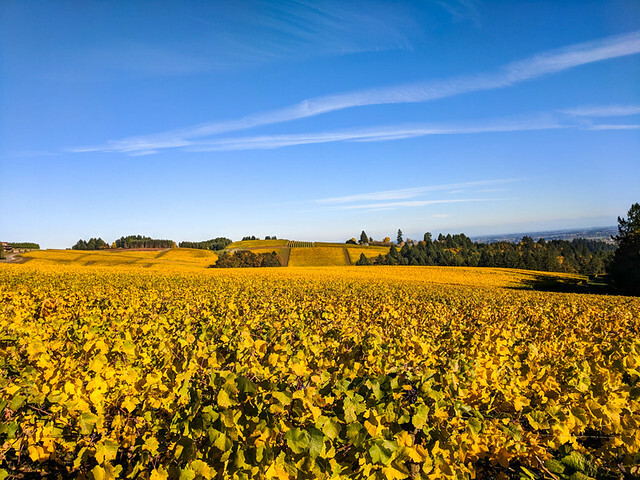 Only five minutes away, our next stop was Erath, one of our favorite places in the valley, and where we have been wine club members for years. Dixie was our entertaining server and we chose to sit out on the patio while she brought us wine after wine in a very relaxed experience. She also mentioned that their penny shipping deal was still going on (!!!) so we selected two cases to have shipped home to us in NC. My only complaint was snacks were not offered (except off the paid menu) – as our last few member tastings came with a small cheese plate. We didn’t ask after it and it wasn’t a big deal. For dinner we chose to walk to the Babica Hen Cafe. Less than a five minute walk from our B&B, it was fine in daylight but a bit tricky after dark as there are no sidewalks. Dinner started out a bit bumpy as a few of the beers on the menu weren’t available, but after a few false starts Eric ended up with a tasty Pale Ale and I found a Pelican Export Stout (not listed on the menu) that was very good. I had the Mad Beaver burger with horseradish aioli, crispy onions and blue cheese (cooked perfectly medium) and Eric had the Texas pulled pork sandwich with fried jalapenos, both with curly fries. Everything was delicious. After a full day we retired to our room to enjoy some of the Hyland Gewürztraminer and plan our Friday.